Hi. I'm restoring a Victor 9K10. Unfortunately the decorative bars on the front are missing. I'm interested in finding replacement parts or information I can use to have them fabricated. Not many images are available on the internet. Any help and guidance would be greatly appreciated. Welcome to the forum and congratulations on having an extremely rare radio in your possession. Unfortunately, the lack of responses to your post is indicative of exactly how rare this radio is - I've been collecting for 21 years and have never come close to seeing one in person. Supposedly only 183 of these were produced. 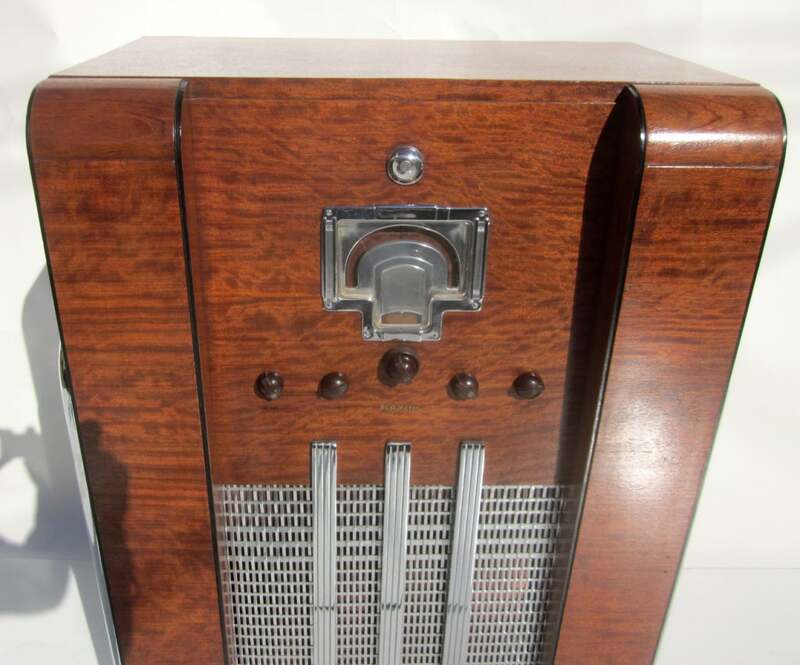 In comparison, Philco was able to churn out over 106,000 of the iconic Philco model 90 cathedral radio, which is still quite common. Is there a chance that the grille bars left an imprint on the wood that might give you an idea as to how wide they were? I suppose you could make up a jig that could hold an angle grinder at a 45deg angle to grind the grooves in the steel, and then you could have the entire finished assembly chrome plated. Whats with the 3 knob holes below the 5 knobs, are they fake or something. Looks to be where the grill bars would go, the grill bars may be just as wide as the control nobs. You could make the grill bars out of a hard wood and lot easier and a hell of lot cheaper than metal for the time being you see. Using a good auto silver paint you can refinish them to resemble polished metal. Thanks for the links and suggestions. Cabinet has been repaired and electronics are working well. The restoration continues, decals (on order) and decorative bars will finish the job. Many thanks to Jim from Jim’s Antiques who patiently worked with me to get the radio to this point. I’ve attached a photo of the progress to date. This may be just a little off the wall but you may want to look at the hood side panels of a 1937 Oldsmobile 6 cylinder. The polished staineless steel strips on there are a very close match . Even the way they curl at the top end. May not be perfect dimensions but would suffice till something better comes along. If you need the dimensions I can measure them on my car. By the way, this model is the one that was in the Christmas Story movie.